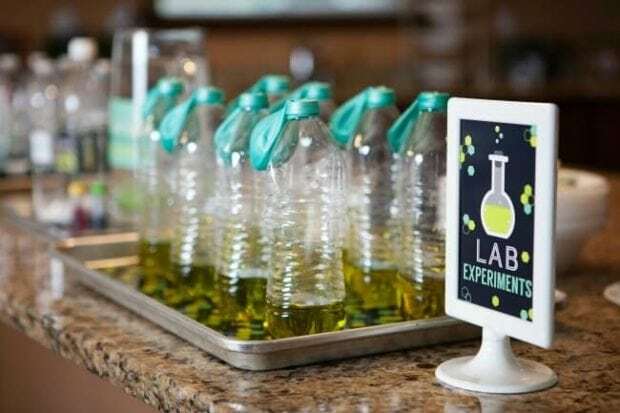 Curious and inquisitive by nature, my son Landon wanted a laboratory science themed birthday party for his 8th birthday this year, complete with experiments and laboratory equipment. 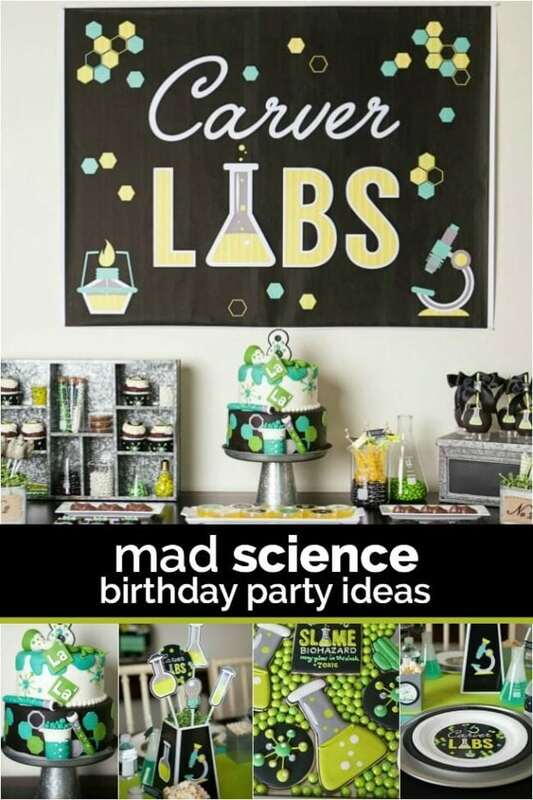 Being a science lover myself, and also the owner of Banner Events, I knew I wanted to put a fun spin on this exciting party theme! 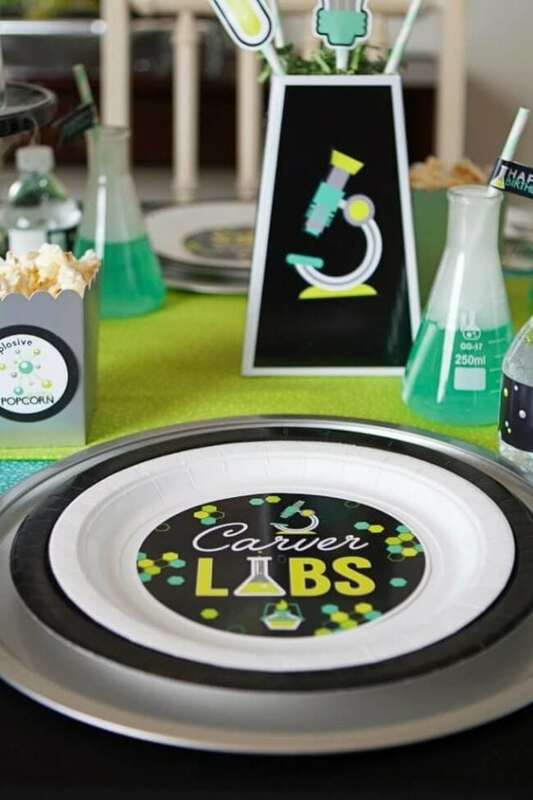 I hope you love how we experimented with party decorations, a dessert tabletop of delicious concoctions and plenty of crazy fun activities to make this one party my son and his science party guests won’t soon forget. Read on to form your own conclusions about the success of our birthday experiment and enjoy the photographs captured by Karina Rigtrup of A Fresh Take Photography. 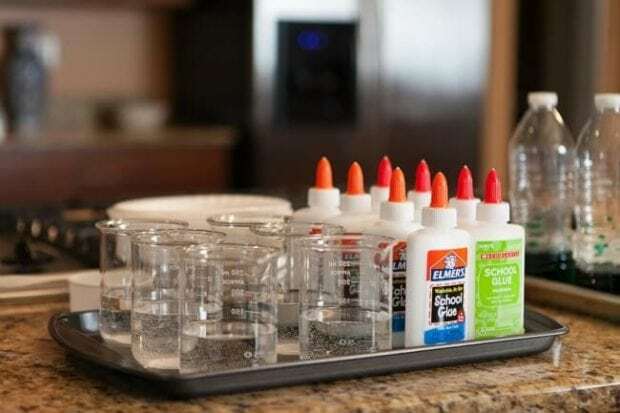 Add these 18 fun science experiments for kids to your next science birthday party. 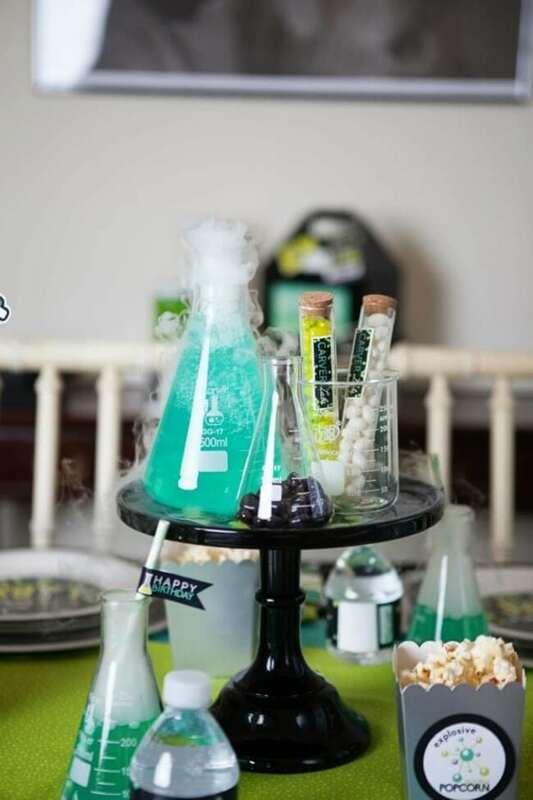 You will go crazy with excitement over these mad science birthday party ideas. Kids can get creative with these DIY slime recipes — perfect for a party activity! To entice friends to come celebrate my son’s 8th birthday explosion, we sent out custom invitations inviting guests to grab their lab coats and join us at a science party. 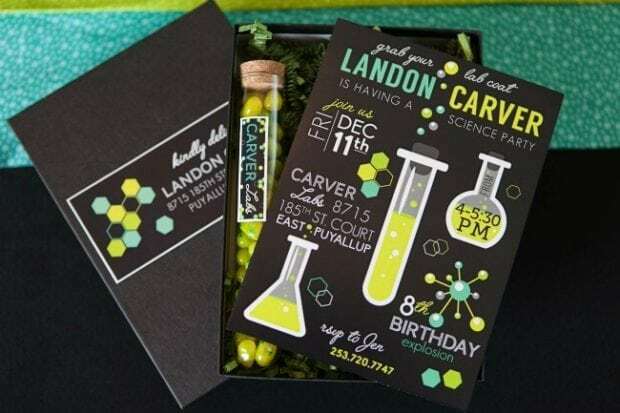 Designed by Jessica Wilcox of Modern Moments Designs, the invitations were such a great way to introduce the science party theme. 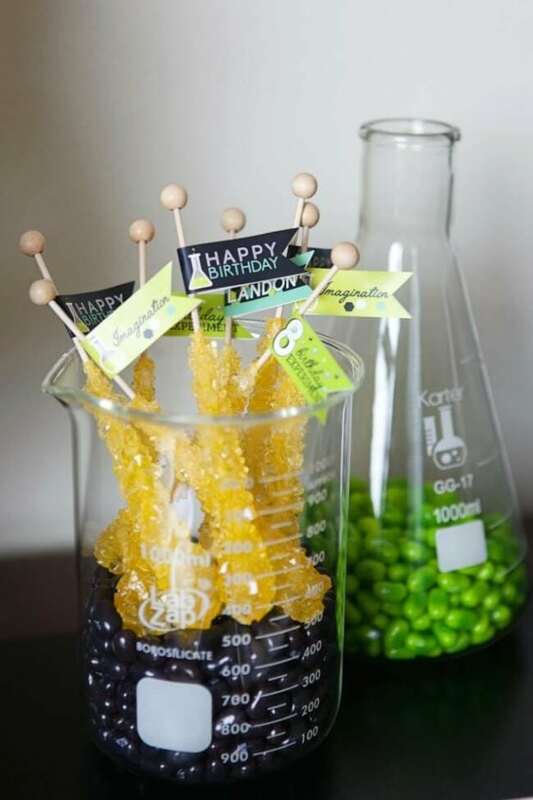 I loved the test tube on the front so much that we chose to deliver each invitation with a coordinating test tube filled with jelly beans. We packaged them up in black boxes that we filled with paper shred and added a custom address wrap also designed by Modern Moments Designs. 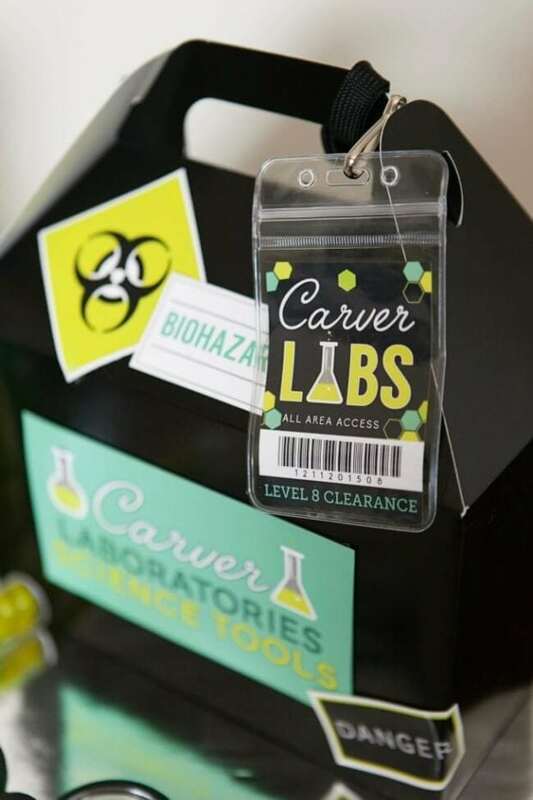 Upon arriving, guests were granted “all area access” with special “level 8” clearance into Carver Labs. Not only were they given their lab badge, but they were properly outfitted in science laboratory attire for the birthday experimenting to come. Personalized science shirts helped us easily identify each “mad” scientist. Lab coats and safety goggles completed the look. 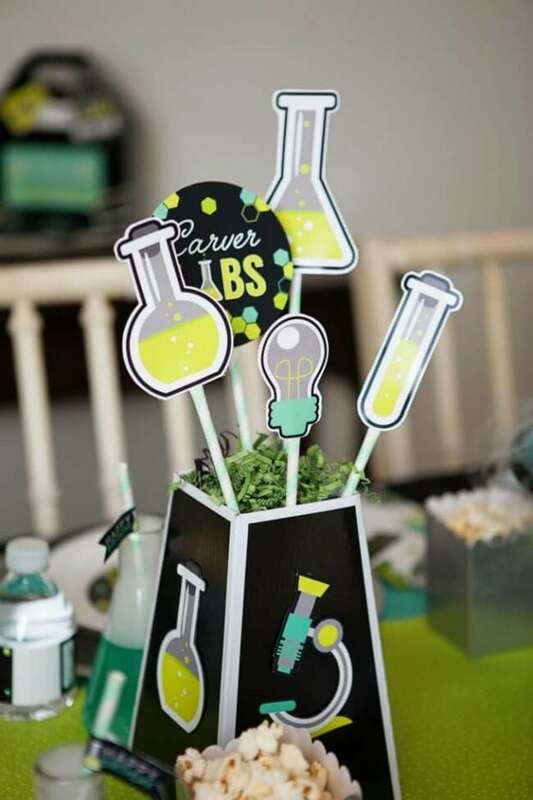 Gable boxes were customized with more amazing printables, and served as the take-home favor box for all of the science tools the boys would be using during the party experiments. Each boy received a customized lab book to store all of the secret formulas, scientific evidence, experiment notes and results and conclusion. Plus, for experiments with color, a set of Crayola crayons was provided. Other tools included tweezers, magnifying glasses, a plastic jar for storing their slime, gummy earthworms to dissect, lab rat suckers to taste test and even a cool mad scientist pen. 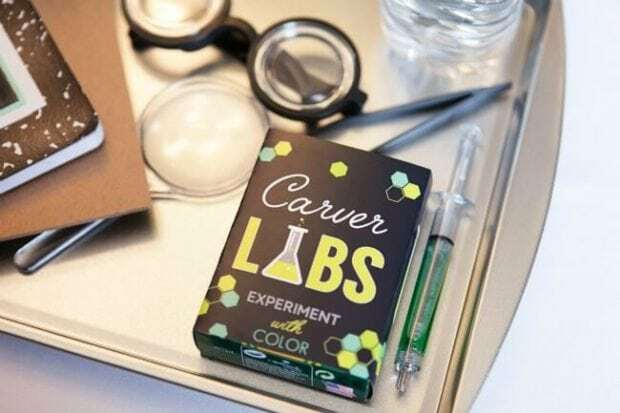 Fun science experiments were conducted at Carver Labs. The guests made slime (a simple formula of water, Borax, white glue and food coloring), which was one of the favorite activities. Food coloring was used in another lab experiment where color mixing was involved. No science party would be complete without an experiment involving vinegar and baking soda. The boys were amazed that combining the two in a plastic bottle could produce carbon dioxide and blow up a balloon. They were even more surprised to feel the endothermic reaction take place and see how heavy the balloon was. The final party activity was a few rounds of science themed Hedbanz. Experimenting works up quite the appetite. Thankfully, I hypothesized such a result and planned ahead to help curb the hunger! I wanted the dessert “table” and dining area to look like a science professor’s office. I hung a framed poster of Albert Einstein on the wall to set the mood. Using my husband’s office desk, I served up various dessert concoctions inspired by science. 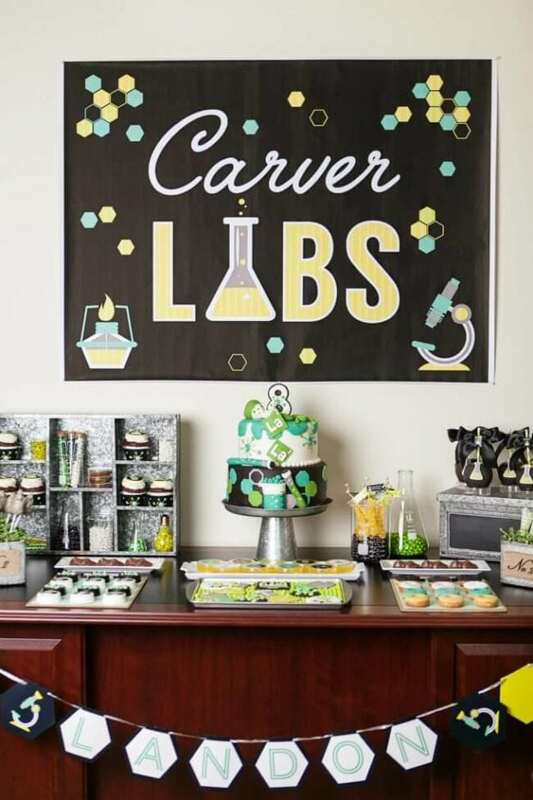 An oversized “Carver Labs” poster tied in the laboratory theme. To carry this theme to the desserts, 4 Kids Cakes designed an unbelievable cake. 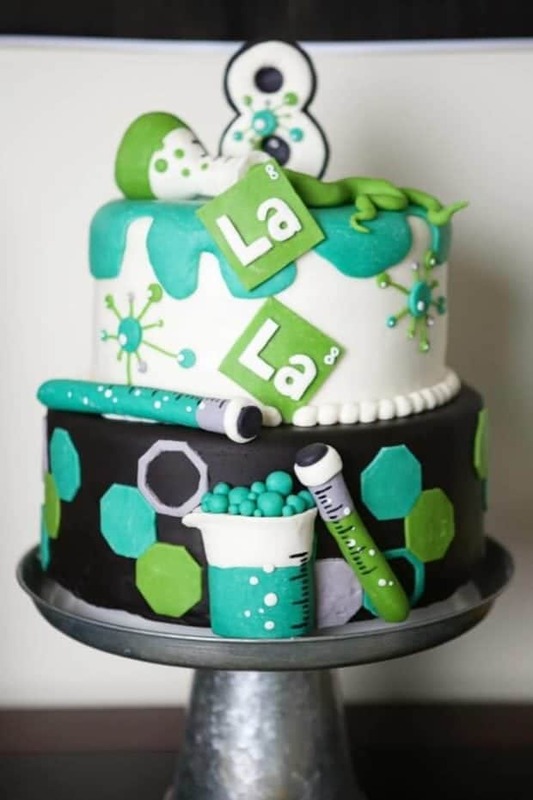 Elements from the printables were incorporated into the fondant designs as well as cool laboratory essentials like beakers and flasks. I love how Christina made my son’s age and name into a new birthday element to use on the cake. 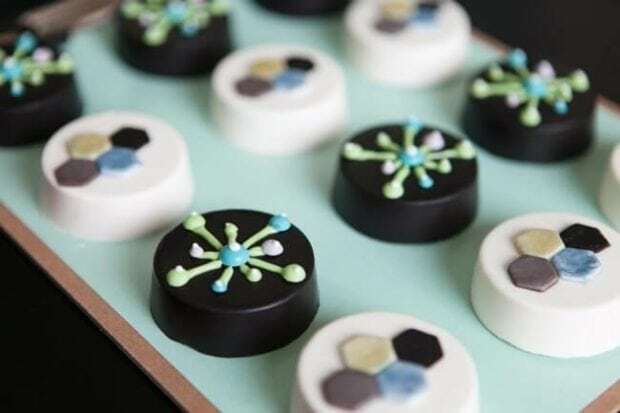 In addition, cupcakes were served, topped with incredibly crafted fondant toppers by Edible Details. Cake is a party staple. Additionally, there were white chocolate-covered pretzel thermometers and milk chocolate frogs made fresh by Morsels Parties. 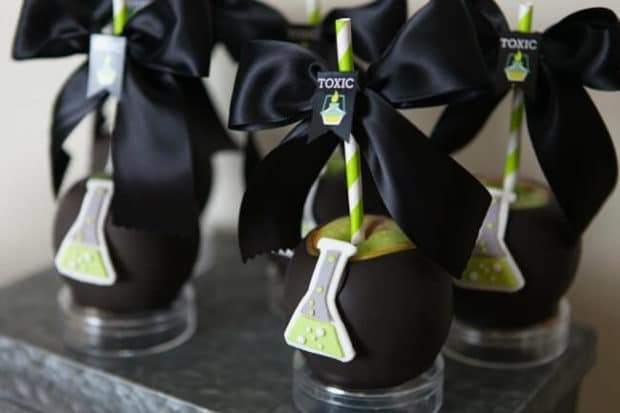 “Toxic” caramel apples by Mammarella’s Sweets & Treats added an exciting option. And I’m pretty positive that every science party needs “The Periodic Table of Donuts”. Green Mountain Mini Baked sent an awesome assortment of baked mini donuts to coordinate with our party colors. 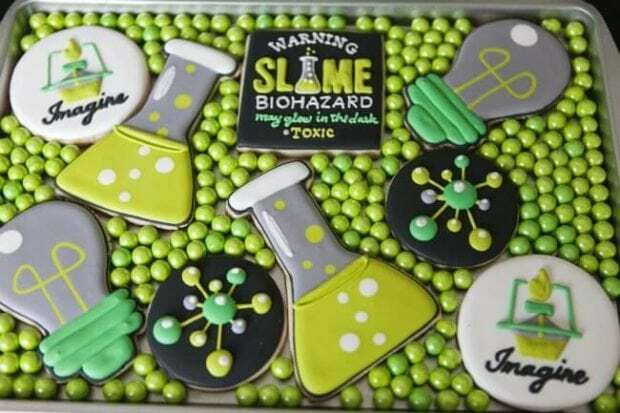 Deliciously cool science themed cookies were another popular pick, as were chocolate covered Oreos by Bella’s Bakery and Bowtique. I loved pulling out clipboards to use as serving trays, as well as using various metal storage shelves and containers. To add some contrast, plain white dishes were used to give that sterile and basic laboratory feel. I mixed in test tubes, flasks and beakers full of various Jelly Belly Jelly Beans for a flavor explosion. Kids put together their own mix of flavors for added fun. 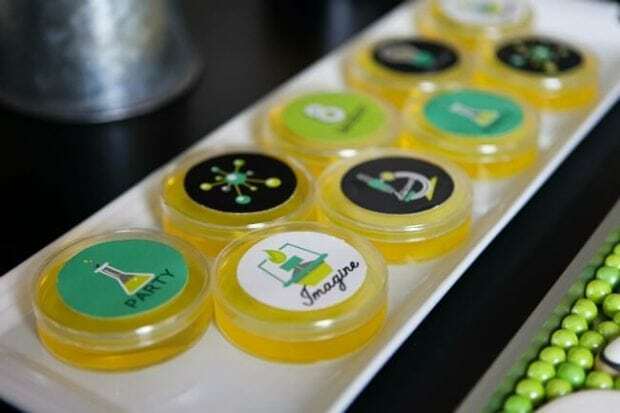 Petri dishes full of Jell-O “agar” were surprisingly a much sought after item too. 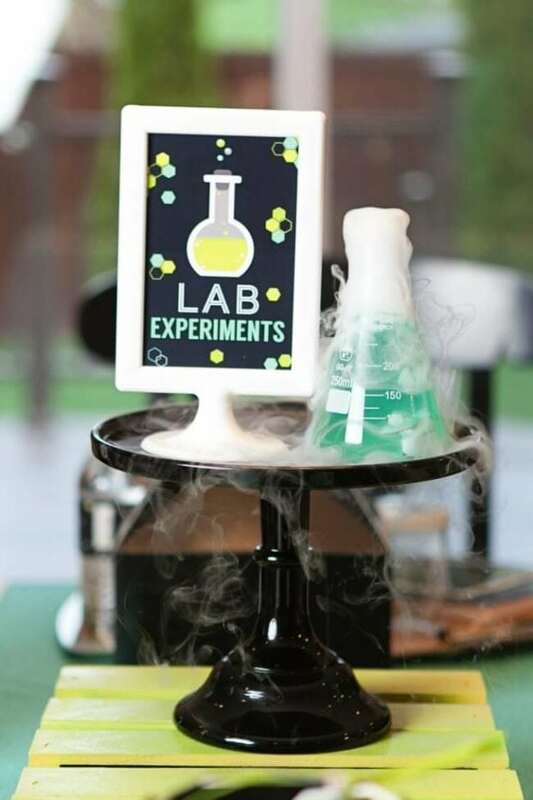 At the laboratory inspired dining tables, laboratory centerpiece picks were arranged and paired with bubbling flasks of scientific solutions. Custom labels were added to plates layered on metal chargers (really, pizza pans from the dollar store). 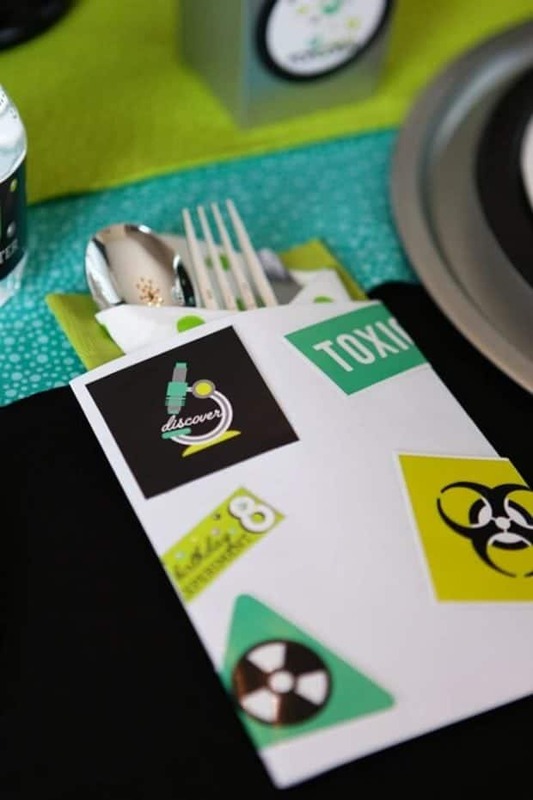 White manila envelopes were labeled with “toxic” and “biohazard” and provided a place for napkins and cutlery. Flasks were filled with blue juice and dry ice for excitement. Water bottles were dressed up in H20 labels. Paper straws were styled with printable science party flags. Favor boxes were filled with “exploding popcorn”. The results and conclusion? 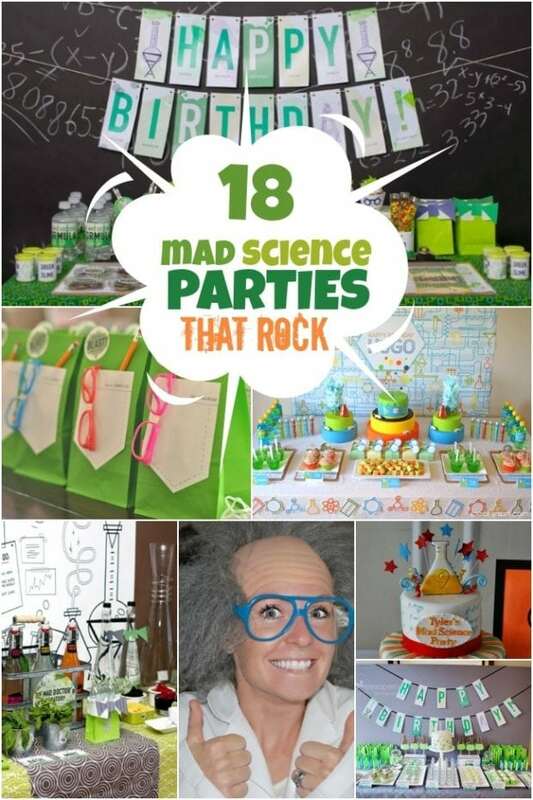 This birthday experiment was a success: throwing a science birthday party was a ton of fun!